Keep your home warm and cozy through the frigid Wisconsin winter by getting a tune-up on your existing furnace or heat pump. If it is time to replace your old or outdated furnace, contact us to install a new energy efficient unit. Make sure the air that you and your family breathe in your home is always as fresh as the air outside by learning how to prevent molds and toxins from entering your living area. Contact us to learn more about indoor air quality and how it effects you. Our primary goal at Wesley Heating & Cooling is to keep you comfortable. We offer you peace of mind, ensuring your equipment operates safely. We help you save money on your fuel bills. And, we help deliver relief to those with allergies and many others concerned with the quality of the air they breathe. By doing what it takes to ensure each customer's complete satisfaction, Wesley Heating & Cooling has earned a reputation for excellence. We grade every job with a "Report Card" which is a brief questionnaire regarding the quality of our clients experience with us. We invite you to give us a call. This site is specifically designed to help you become an informed consumer when it comes to your home's heating and cooling systems. Go ahead, explore. The pull-down menus make it easy. Not only will you learn how these systems work, but also how to shop smart andprotect your investment. Very Impressed - Not one clue that once the job was done that anyone had been here! Easy to deal with, Prompt, on time. Did what you said, nice people, called ahead of time, updated on service workers arrival. The difference from the old one making noise [from the] exhaust pipes and blower fan, this [furnace] is quiet, no noise. If I didn't have AprilAire on to hear a click, I wouldn't know it was on. Thank you so much for the fast service, the situation could have been very bad with the carbon monoxide. Fast action by the office and technician were greatly appreciated. The office temp is much warmer with the new system. The only problem I have now is the furnace is to quiet. The wife keeps asking if it is running. Our old furnace there was no question if it was running. Thanks for a job well done. The new furnace runs very quiet - like having radiator heat - very level temp. Thanks! Very professional. Work was done promptly and efficiently. They took care of our needs and possibly saved our lives. The central air is so quality, I can't even think of going elsewhere! You have quality stuff. The air installer was great! I've always had Blah, now I have Wow! As long term customers we have found recommended equipment dependable and services prompt and reliable! Awesome service, extremely professional - all the way around! I have been satisfied with your company for 30 years. That says a lot. I tell people about you! Top Notch =) Our furnace went out Friday night. Your salesman called me on Sunday. New unit in by Monday. Now that's service! As good as it gets. I don't know how it could have gone better. We have 9 furnaces and 9 air conditioners in our properties. Wesley heating and cooling in Green Bay, WI does all of our services and repairs when any unit be it a Lennox or other brand needs to be replaced we have a Lennox unit installed. We are very satisfied, thank you. It seems no matter what, Wesley makes time to fit us in even when your swamped. When your wife is 9 months pregnant that's appreciated. If you're interested in replacing your old outdated and probably inefficient heating or cooling system, see how we assure your satisfaction. Learn how you can save energy and ultimately save money through our Heating & Cooling Maintenance Plans. Contact us today to ask about financing options for your new installation or unit repair. Good on any Heating - Cooling Precision Tune-Up or Repair Service performed by Wesley Heating & Cooling at their residence. One coupon per service address will be accepted. Coupon must be presented at the time of service. Payment for the balance is expected at the time of service. This Coupon entitles a Homeowner to a $150.00 Discount off any New System consisting of a furnace and air conditioner installed by Wesley Heating & Cooling at their residence. If either a furnace or air conditioner only are installed, the Discount is $75.00 Only one (1) coupon per service address will be accepted. Coupon must be presented at the time of order and cannot be combined with any other coupon or discount. Special financing terms are available to approved credit. The team at Wesley Heating & Cooling loves to serve the Green Bay area with Community Service. 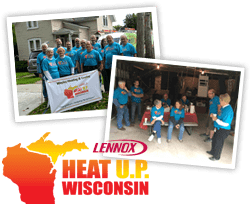 They recently teamed up with Heat Up Wisconsin to install a new free furnace for a Vietnam veteran. Wesley Heating & Cooling, is a Wisconsin (WI) Heating, Cooling, Air Conditioning, Geothermal Heat Pump, Ductless Mini-Split, Solar, Boiler and Furnace repair, service, replacement, and maintenance Company located in Green Bay & Brown County. Wesley Heating & Cooling employs only the best technician for air conditioner, furnace, and boiler repair as well as all air conditioner replacement, furnace replacement and boiler replacement in Green Bay WI, Oshkosh WI, Fond du Lac WI, Abrams WI, Algoma WI, Allouez WI, Appleton WI, Ashwaubenon WI, Bellevue WI, Brown County WI, Casco WI, De Pere WI, Denmark WI, Howard WI, Kewaunee WI, Little Suamico WI, Luxemburg WI, New Franken WI, Oneida WI, Pulaski WI, Suamico WI, Campbellsport WI, Berlin WI, Eden WI, Johnsburg WI, Lomira WI, Neenah WI, Menasha WI, Mt Calvary WI, North Fond du Lac WI, Oakfield WI, Omro WI, Pickett WI, Ripon WI, Rosendale WI, St Cloud WI, Van Dyne WI, Waupun WI, Winnebago County WI, Winneconne WI, Fox Valley WI. So when you ask to find "A good heating and air conditioning repair or service company near me," you've come to the right place. To set-up a repair service estimate or replacement estimate, call (920) 468-6951. Wesley Heating & Cooling (WHC) is an authorized factory dealer of many brands and services all furnace, AC, boiler, humidifier, filter, indoor air quality, thermostat, radiant floor heating, air purifier, air exchange brands including Lennox, Air Flow, Armstrong, Concord, Healthy Climate, Buderus, American Standard, Bryant, Carrier, Goodman, Janitrol, Rheem, Rudd, Sears, Tempstar, Trane, Weil McLain, Payne, Amana, Crown, Daiken, Frigidaire, Gibson, Maytag, AprilAire, Honeywell, White Rodgers, SpaceGard, Dynamic, Wirsbo, Uponor, Burnham, Unico, Space Pak, Arcoaire, Arzel, Bard, Borg Warner, Chrysler, Claire, Comfortmaker, Climatrol, Coleman, Ducane, Dunkirk, DuoTherm, Duomatic Olsen, General Electric, Heil Quaker, Hydrotherm, ICP, In-Floor, Intertherm, Kenmore, Luxaire, Magic Chef, Miller, Milwaukee Thermoflo, Samsung,Slant Fin, Utica, Vailant, Signature, Warm Morning, Weatherking, Westinghouse, Whirlpool, Williams, Williamson, Xenon and York.